Challenging assumptions about what is possible. 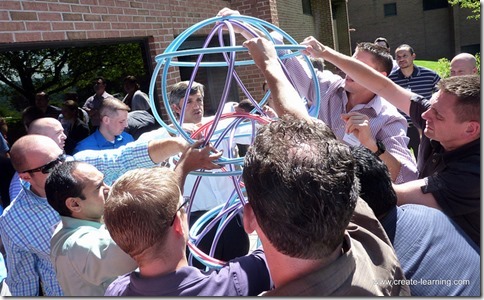 Every company, team, and person has established patterns of What, Where, When, Who and How something gets done. It ranges from simple things like arriving at work and when we break to complex things like employee onboarding and hiring practices, taking time as a team to challenge the existing assumptions and work to create small steps. Can break inertia (stuckness) in how your project team operates. While building a shared understanding of ‘why we are here’ and how we can improve things. 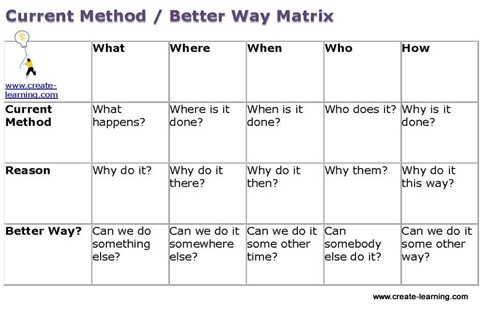 The Current Method / Better Way Matrix is a Team Project Management Tool that supplies people with a tool to challenge existing assumptions – while providing structure for everyone to feel comfortable. The tool can help the team develop ideas through discussion and discourse when options for goals and implementation are established everyone has a well developed (and known) understanding of the steps. First, you have to identify what you are going to explore as a team using this tool. The clearer you are with exactly what you want to improve and develop the better your results will be. You can copy the chart above on a white board and supply each team member with a chart. I recommend the handout has the headings – What: Where: When: Who: How – across the top; Plus, – Current Method: Reason: Better Way – down the left side; with the remaining areas left blank for people to write. The team works through the matrix starting with the left column – What – and discussing the Current Method then Reason ending with Better Way?. The team facilitator I recommend the team leader / Project Manager documents the responses on flipchart paper. Once you understand and discussed the What column move onto the Where and then onto the other columns respectively. At this point, the team has discussed and explored various options of better and different ways to improve upon the process/ tasks. Using this information the team can start to develop goals and implementation steps. The Current Method / Better Way Matrix is a team tool that can stretch minds and assumptions to Enable Innovation and create a comfort level that allows for breakthrough ideas to happen. Reference: First saw this technique in ‘The Team Handbook’ by Scholtes, Joiner, Streibel.